In the nineteenth century, Odessa had the unofficial status of the third capital, after St. Petersburg and Moscow. Therefore it is not surprising that every year the sculptures became more and more. 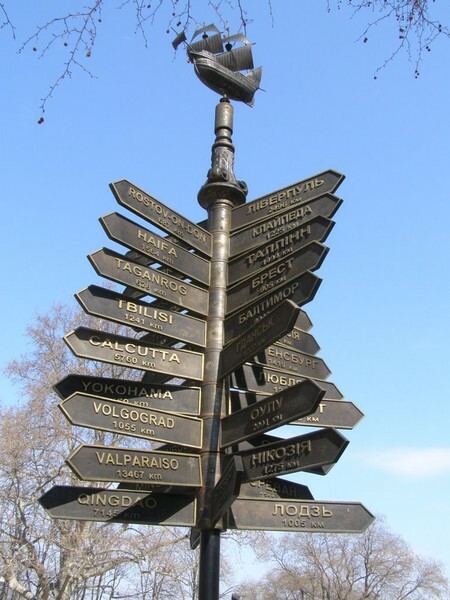 In addition, the city has always been famous for its humor and eccentricity, which is reflected in the monuments. Perhaps there are no simple boring monuments, they are all unusual. 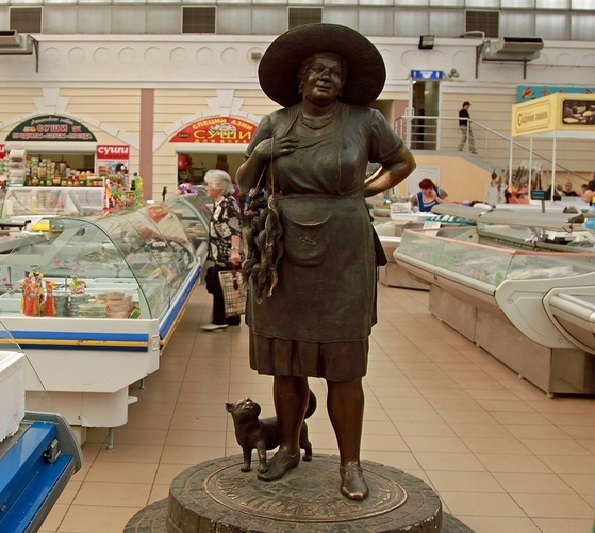 This lady can be seen in the famous fish market. Where else is the fisherman Sonia?The monument is a smiling lush woman. She’s wearing a hat, with bulls strung on a rope, and at her feet – a big cat that wants to eat fish. There was a monument in 2006, and is in the trade pavilion New Privoz. A sculpture called The House of the Sun appeared on the city beach of Lanzheron. 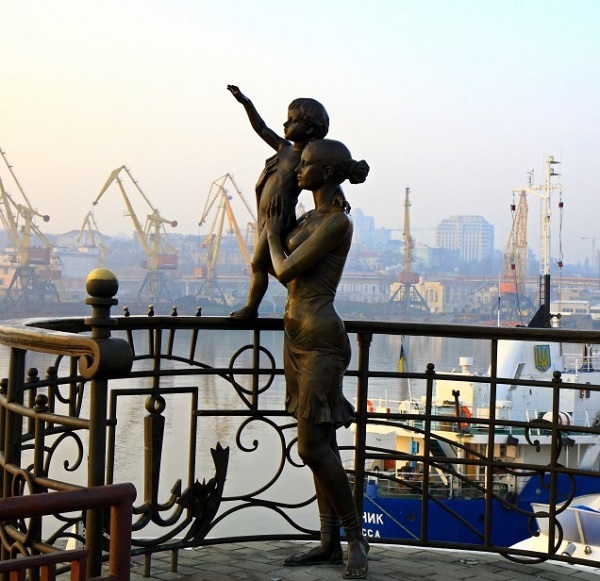 It was created by the famous sculptor and artist Mikhail Reva. According to the idea of ​​the author, through it you can observe the first rays of the morning sun and its setting. The prototype was the very legendary doors of Odessa’s ceremonial. The monument became the hero of many posts in the social network Instagram. So do not waste time and be in a trend. 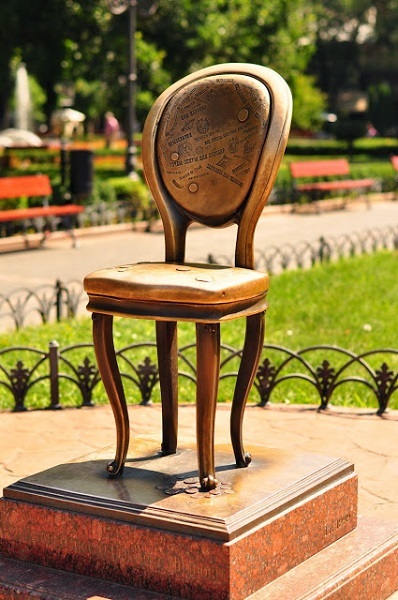 Bronze chair townspeople dedicated writers Ilf and Petrov in honor of the legendary novel “The Twelve Chairs”. This is a kind of tribute to funny jokes. The monument to the 12th chair was opened on April 1, 1999. And he is on Deribasovskaya Street. The guests of the city are lining up to sit on it and take a photo for memory. Or as it is also called “a monument to a bribe”. At the time of the founding of Odessa, Emperor Paul I, having not received much income from the port, decided to stop its existence. But resourceful merchants sent him several carts of oranges. And the king was so flattered by such a gift that he continued financing. The monument is located on the boulevard Zhvanetsky. He is on the Duma Square, exactly near the City Hall. 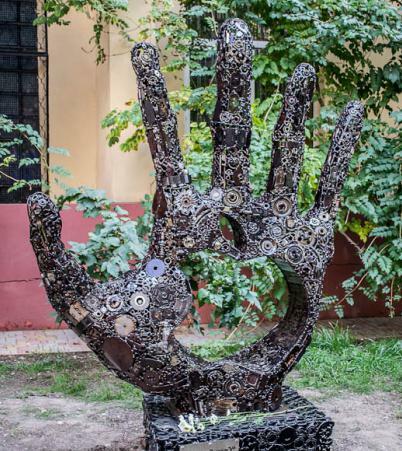 There is a sculpture of 39 plates, which indicate the sister cities of Odessa and the exact distance to them. It is curious that each plate is turned in the direction where the “brother” of the Pearl is located near the Black Sea. The index was inaugurated in 2005. It will be interesting to those who follow the world of technology. It is a palm with a picture that has become a kind of icon, an apple. A monument appeared thanks to the work of students of the Academy of Technical Regulation. The monument from a set of the smallest iron details is executed and have created it in memory of achievements of Steve Jobs. Go to Novoselskogo Street, 74, and appreciate this work of art personally. This sculpture causes warm emotions in the viewer. It is installed near the sea on the Marine Station, in honor of the wives and children of sailors, who faithfully wait and believe. The author has captured a trembling family moment. 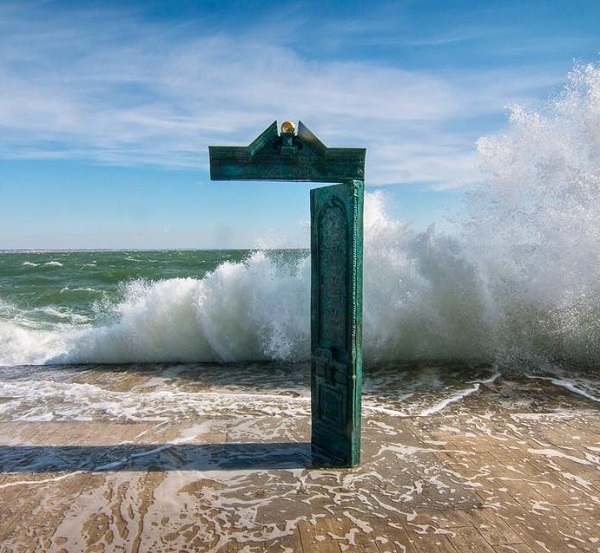 This monument became a kind of symbol of Odessa. It was here, in the Seaport, quite often there were such scenes. Mother and waving baby handle, escorted to the flight of his father. 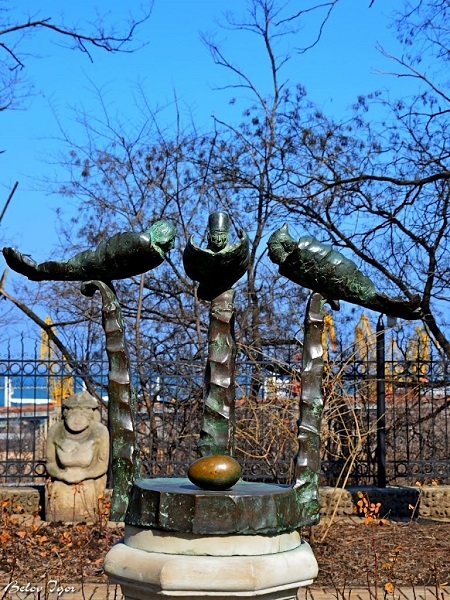 The monument is rather extravagant, judging by its description: the three greatest literary figures Gogol, Pushkin and Babel with interest consider a golden chicken egg, from which the new genius is about to “hatch”. 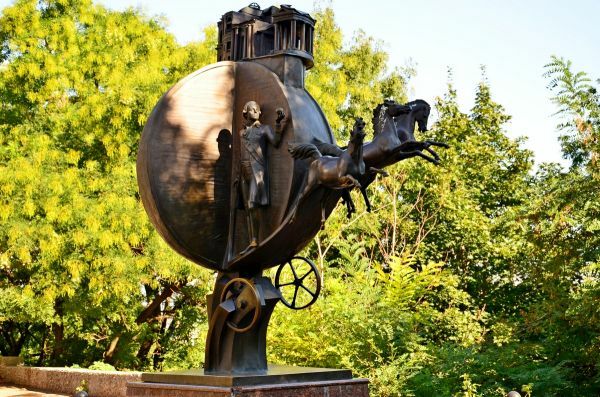 Sculpture, which literally dazzles with colorful Odessa humor, is made of bronze and created by the poet and sculptor Nikolai Stepanov. You will find the composition in the courtyard of the Literary Museum. Although the monument appeared only in 1996, some traditions have already been associated with it. Among the students there is a legend that if you look at this golden egg before the exam, it will pass successfully.